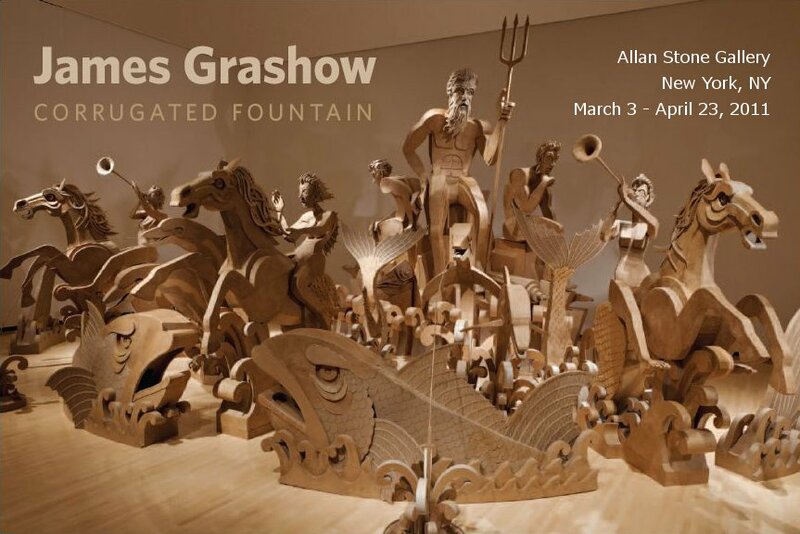 James Grashow’s sculpture, Corrugated Fountain, will be exhibited from March 3-April 23, 2011, at Allan Stone Gallery, 113 East 90th St., New York, NY. There will be an opening reception with the artist on Saturday, March 12, from 4-6 pm. Grashow works in cardboard. That sounds like it might look blocky until you see the result. The sculpture, inspired by Rome's Trevi Fountain, looks incredibly fluid, full of graceful curves and sea creatures, at the center of which is a very mighty-looking Poseidon. The cardboard looks hardly monochromatic—the dimensionality enhances the rich, brown tones of the paperboard. The gallery will also be screening excerpts from The Cardboard Bernini, a documentary on James Grashow by Olympia Stone. A fully-illustrated book of his work will be available.